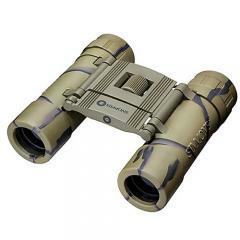 Powerful, versatile and easily transported, the ProSport Camo FRP Binoculars from Simmons are a versatile entry-level optic perfect for any outdoor activity, from hunting to sports games. Fully coated lenses with a 25-millimeter objective lens offer optimal light transmittance to deliver a sharp, vivid image from sunup to sundown. The tough BK7 roof lenses provide a slim and effective design that is easily collapsed into a compact size that can be carried in cargo pockets, backpacks and purses. A rugged, rubber armor provides a secure grip and protects the binoculars from drops, bumps and dings that come with everyday use. Comfort eyepieces and a generous field of view allow operators to quickly acquire targets with maximum comfort.